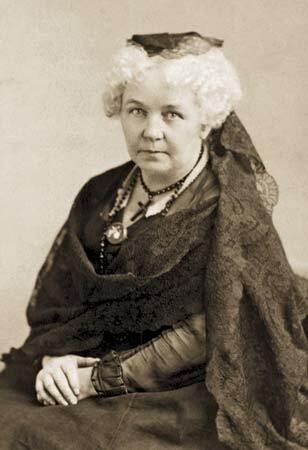 Introduction: Elizabeth Cady Stanton was a very prominent proponent of a woman’s legal and social equality during the nineteenth century. In 1848, she and others organized the first national woman’s rights convention in Seneca Falls, New York. She co-authored that meeting’s Declaration of Sentiments, a document modeled on the Declaration of Independence, and introduced the most radical demand: for womans suffrage. In retirement, Stanton produced three volumes of the History of Woman Suffrage (1881-85) with Susan B. Anthony and Matilda Joslyn Gage. In this work, published several decades before women won the right to vote, the authors documented the individual and local activism that built and sustained a movement for women’s suffrage. Biography: Elizabeth Cady was born in Johnstown, New York, November 12, 1815. Her parents, Margaret (Nee) Livingston and Daniel Cady were among the town’s most prominent citizens. Her father, Daniel Cady, was a well-known lawyer who had served in Congress, in the New York state legislature and as a judge on the New York state Supreme Court. Her parents had eleven children, most of who did not survive to adulthood. Eleazar Cady, their only son to survive, died when he was twenty, leaving them only four daughters. Elizabeth Cady studied at the Johnstown Academy and at Emma Willard’s Troy Female Seminary. She also acquired a considerable informal legal education from her father, who trained many of New York’s lawyers. As the daughter of a judge, she was exposed early to the legal barriers to women’s equality. For example, she heard her father tell abused women that they had no legal alternative but to endure mistreatment by their husbands and fathers. She became especially outraged learning that the rights of husbands gave them control over their wives’ property. 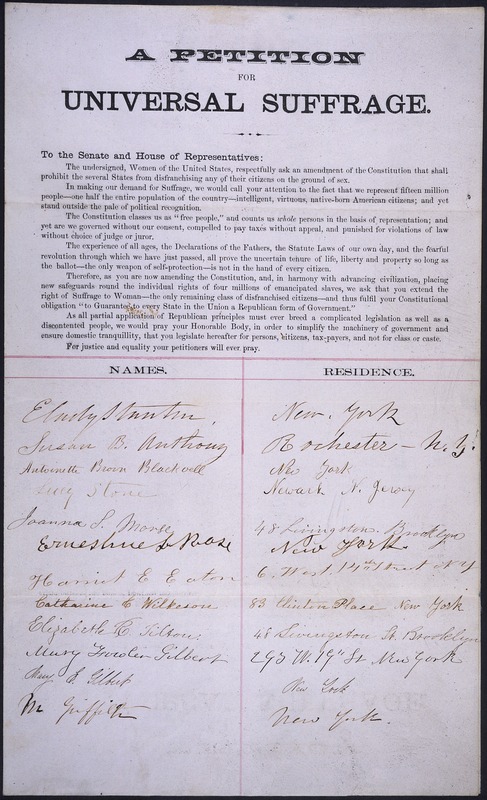 Woman’s Rights: In 1840 Elizabeth Cady married the antislavery orator Henry B. Stanton. Her feminist side was displayed at the wedding ceremony when she insisted (and Stanton agreed) that she would not give the wife’s traditional promise to “obey” her husband. She also opted to keep her maiden name as Elizabeth Cady Stanton, rather than going by the name of Mrs. Henry B. Stanton, an unusual decision for the times. Her marriage to Henry Stanton introduced her to the most advanced circles of reform as well as to motherhood and domestic life. In 1840 she traveled with her husband to London to attend the World’s Anti-Slavery Convention. An active abolitionist herself, Elizabeth Cady Stanton was outraged when the organizers of the Convention denied official standing to women delegates, including Lucretia Mott who was there with her husband. From this experience, the two women vowed to work for more equal rights for women. Henry Stanton sympathized with his wife’s ambitions for a wider role in the world; however, he was not wealthy, and, for the most part, she remained home raising her children. Between 1842 and 1859 Elizabeth Cady gave birth to seven children. Nevertheless, she was able to do some writing and speaking for the feminist cause. In 1848 she and Lucretia Mott called for and organized America’s first woman’s rights convention to be held in Seneca Falls, New York, where the Stanton’s lived. Stanton co-authored that meeting’s Declaration of Sentiments, a document modeled on the Declaration of Independence. She also composed a declaration of principles, which described the history of humankind as one in which men had repeatedly and intentionally suppressed the rights of women in order to establish “absolute tyranny” over them. Despite opposition, she persuaded the convention participants to approve a resolution calling for women’s suffrage, or women’s right to vote. Stanton met Susan B. Anthony in 1851, and their remarkable collaboration began at once. As a single woman Anthony was free to travel and earn her living from her reform work, providing Stanton with more active ways to educate and agitate for her reforms. Anthony, it turned out, was also more skillful than Stanton at organizing people to carry out their shared ideas. After the Civil War, when Stanton felt free to travel, she became one of the best-known women in the United States. Stanton served as president of the National Woman Suffrage Association (1869–90) and of the National American Woman Suffrage Association (1890–92). With Anthony as publisher she and Parker Pillsbury edited (1868–70) the Revolution, a militant feminist magazine. Elizabeth Stanton was a brilliant orator and an able journalist, and as a writer and lecturer she strove for legal, political, and industrial equality of women and for liberal divorce laws. She spoke on topics like maternity, the woman’s crusade against liquor, child rearing, and divorce law, as well as constitutional questions and presidential campaigns. Thriving on controversy, she championed notorious victims of the double standard like Abby McFarland Richardson and Laura Fair. While she entertained her audiences, she challenged them to examine how inequality had distorted American society and consider how equality might be achieved. daughter of Elizabeth Cady Stanton. “How well I remember the day! George Thompson and William Lloyd Garrison having announced an anti-slavery meeting in Seneca Falls, Miss Anthony came to attend it. These gentlemen were my guests. Walking home after the adjournment, we met Mrs. Bloomer and Miss Anthony, on the corner of the street, waiting to greet us. So began the famous friendship of the women who changed our lives. When Stanton and Anthony met, no woman could be a licensed doctor or lawyer—she couldn’t even go to college. If a woman earned money, she had to pay taxes but she couldn’t vote. Slavery was still legal. A husband could hit his wife with abandon and put her away in an institution. By the 1880s Stanton had tired of travel and organizational leadership. 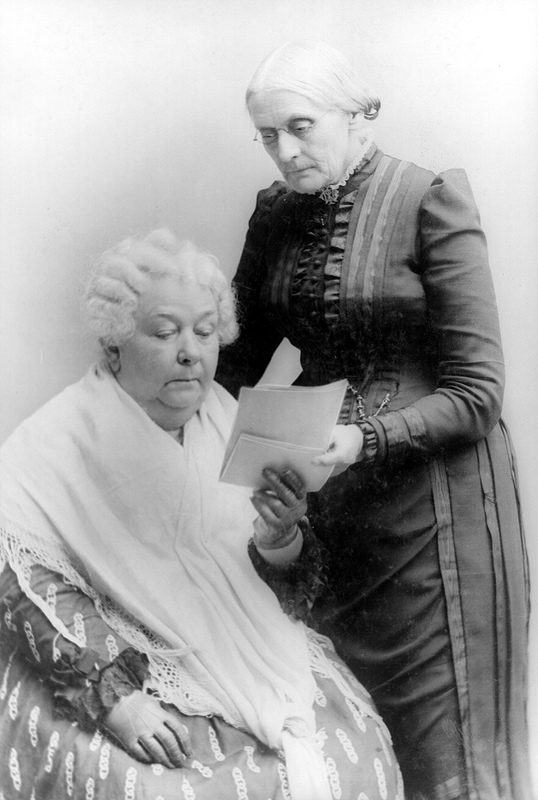 Already sixty-five years old, she became more sedentary and focused on her writing, producing one of her greatest legacies, three volumes of the History of Woman Suffrage (1881-85) with Anthony and Matilda Joslyn Gage. In this work, published several decades before women won the right to vote, the authors documented the individual and local activism that built and sustained a movement for woman suffrage. Stanton died in October 1902 in an apartment in New York City that she shared with two of her grown children. Banner, Lois W. Elizabeth Cady Stanton, A Radical for Women’s Rights. Boston: Little, Brown, c1980. Griffith, Elisabeth. In Her Own Right: The Life of Elizabeth Cady Stanton. New York: Oxford University Press, 1984. Dubois, Ellen Carol, editor. The Elizabeth Cady Stanton-Susan B. Anthony Reader: Correspondence, Writings, Speeches. Boston: Northeastern University Press, 1992. Stanton editor with Susan B. Anthony and Matilda Joslyn Gage. History of Woman Suffrage. Rochester, NY: Susan B. Anthony: Charles Mann, 1881-1922. Rochester, NY. National American Woman Suffrage Association. This was an interesting piece, I’m happy I stumbled it and I’ll certainly be back to read what others have to say regards the matter. Again, thanks.